Linn offers free 24-bit Studio Master Christmas downloads in December | What Hi-Fi? 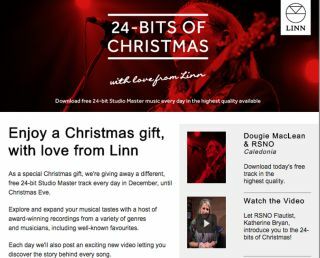 Scottish hi-fi specialist Linn is offering free 24-bit downloads throughout December, with one new Studio Master track a day being released from December 1st until Christmas Eve. And to give you a taste of what's to come, you can today download a free preview track - Dougie MacLean's Caledonia, performed with the award-winning Royal Scottish National Orchestra. Throughout December Linn will give away music in a variety of genres and from a mix of musicians, including some well-know favourites. There'll also be a video each day telling the story behind every song. All you have to do is go to www.linn.co.uk/christmas to download your free tracks.